and rainbows for dark hours. When in the middle of your own storm, look UP for the rainbows, born only when sonshine is added. Very pretty! The best rainbow I had ever seen was in England. We had to pull the car over to the side of the road because there in the field were TWO full sized rainbows. It was amazing, and the first full rainbow I'd ever seen. Then just a month or so ago my daughter and I were driving and we saw a full rainbow. That IS a sweet shot. I love rainbows, but they are so hard to capture. You did it beautifully. How beautiful! !Hopping over from Susan's blog because I saw your name and had to smile at that Brady Bunch episode!! I have loved rainbows - anything rainbow - since I was in junior high. As I have matured, I have always found comfort to see them after a storm. Thanks for sharing this one - its a beauty! The kids and I are reading through Genesis in the mornings and we just read this passage in Gen. 9 this morning. 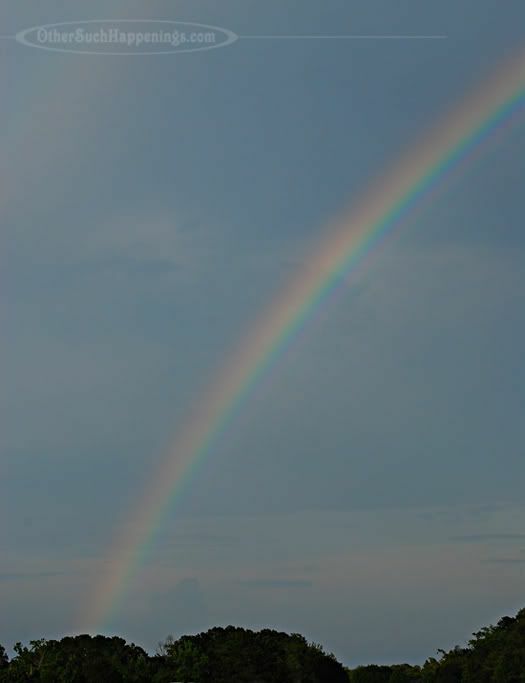 knowing what special significance a rainbow has for you makes my heart sing for the gift. I have yet to snap a shot of a rainbow. I need to add that to my growing list. So always see such fabulous rainbows! He is so good!